It’s Tax Day for USers, and the puzzle offers some relevant amusement to distract us from the pain. Each theme entry has three letters circled. 18a [It flows from the Himalayas to the Bay of Bengal] is the GANGES RIVER. 20a [Piece of sports equipment with strings] is a TENNIS RACKET. 36a [“If memory serves …”] is AS I RECALL. 55a [Where heads of the Pacific are found?] is a fun clue for EASTER ISLAND. 60a [$ $ $] are DOLLAR SIGNS. And a revealer at 69a: [Tax org. 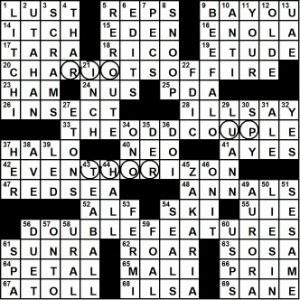 undergoing some “reform” in this puzzle’s circled squares] is, as you’ve undoubtedly deduced, the IRS. This is a solid Monday theme. All the theme answers are in the language and well-clued. “Reform” is a smidgen cryptic but you don’t need to understand it in order to get the answer. Five theme answers + a three-letter revealer = a grid design with lots and lots of three-letter words. This in turn leads to a lot of abbreviations and acronyms (CAM, MAG, SEP, PDA, IRA, SSR, REI, LBO, ERS, DRS, NEA and probably a few I missed). Meh. Our old friend ERE gets an actual passage of poetry instead of the usual reference to being poetic: 12d [“But I heard him exclaim, ___ he drove out of sight …”]. I enjoyed the juxtaposition of ZIP and ZAP. I did not enjoy the “anagrams of each other” juxtaposition of SRTA and TSAR. The anagrams in the theme were enough. Many of my colleagues would laugh very hard at the idea that DRS are [Hosp. V.I.P.s]. Discuss these if you wish. They don’t do much for me. 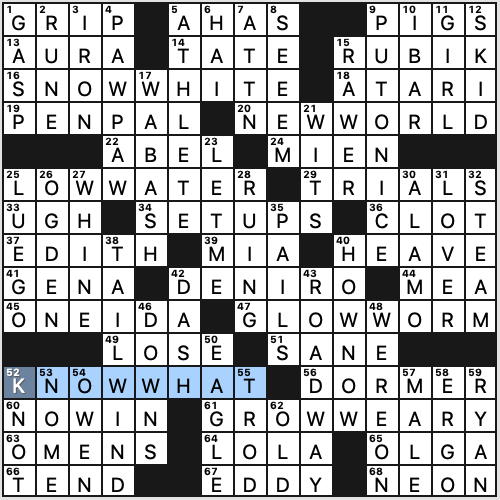 Fair warning: The Monday puzzle drops at the same moment as Game of Thrones comes on, and, well…you know…priorities. I solved this on my phone without seeing the title. I thought, “Double-Ws…or quadruple-Us…okay.” Seeing the title makes everything click more nicely. It’s Tax Day! No extra days this time as in years past. I hope everyone has already filed by this point. Our grid reminds us not to forget to list any extra income that might be found on Forms W-2. 16a [Happy friend] SNOW WHITE. This clue is usually reserved for the entry DOC, but here it goes for the big lady herself. We recently went to Disneyland, and the SNOW WHITE ride is still there, but we did not partake. 25a [Minimum level of a river or reservoir] LOW WATER. Not sure I’ve ever heard this phrase used without modifying a noun like “mark” or “point,” but online dictionaries tell me it’s legit. There seemed to be a lot of proper names today (RUBIK, ABEL, EDITH, MIA, GENA, DE NIRO, LOLA, OLGA…and that’s just the Acrosses), but they were easy enough with the clues. All in all, a fine tax-themed puzzle that wasn’t too taxing on this Monday. 3.5 stars. Moderately unusual grid for this themeless. The central row comprises just two three-letter words. However, those 13-letter entries flanking it are substantial indeed: 31a [They’re sometimes given college credit] UNPAID INTERNS and 35a [One socialized with social media, say] DIGITAL NATIVE. Regarding the former, it’s a terrible practice, which serves to help maintain the status quo of inequality of opportunity and wealth potential. As there are many articles and essays about this, here’s a link to the results of a web search. Crossing those are similarly hefty downs: 19d [They get the memo] POST-IT NOTES and 24d [Common footnote qualifier] ITALICS MINE. The rest of the grid understandably is built on the armature of these four marquee entries. Easy clues to misread: 4a [Sure loser] as Sore loser (BAD BET), 15a [Scarlett’s kin]—note double-T—O’HARAS. Completing that little upper central stack is 18a [Bay Area city] NOVATO, which was unknown to me. 22a [Chip on one’s shoulder, casually] ’TUDE (from attitude). 23a [South American monkey] TITI. This is the subfamily Callicebinae, with three extant genera. Wiki of titis, for your convenience. I feel I should now mention that What We Do in the Shadows (clip above) was co-written and directed by Taika Waititi. 44a [“___, queen”] YASSS. Needed the crossings to determine the apportionment of As and Ss. 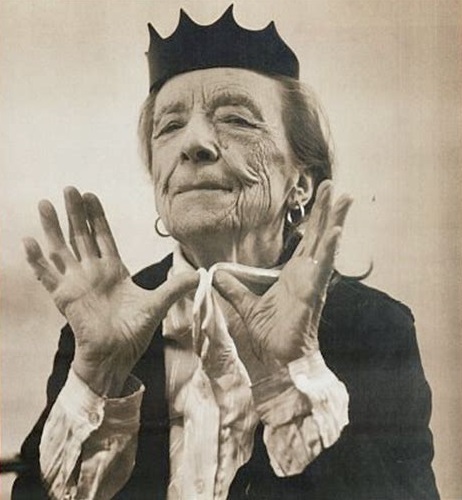 53a [Bourgeois of the avant-garde] LOUISE. 36d [“Here!”] TAKE ONE crossing 56a [“__ the Way,” Loretta Lynn song that ends with the line “I hope it ain’t twins again”] ONE‘S ON? Really? 46d [Charlton and Marlene’s “Touch of Evil” co-star] ORSON. Highly recommended, despite Heston’s rather awful performance. Often dubbed “the greatest B-movie of all time”. I really like this theme! 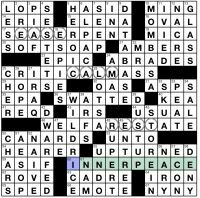 It takes the “word hidden in a themer” approach one step further by hiding a different PEACE-related word in each themer: EASE, CALM, and REST. That extra touch made the solving experience that much more enjoyable. – I’ve never heard SOFT SOAP used as [Persuade with flattery] before, so both the constructor and I might be showing our respective ages. 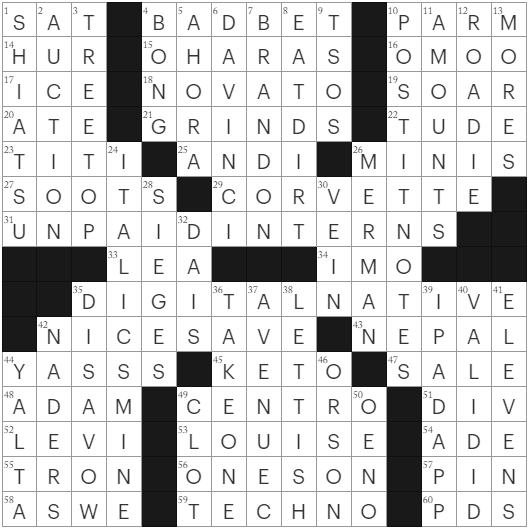 – IRS made it into the April 15th puzzle! – Glad to see ELENA Kagan, Edith PIAF, MRS Dash, and CHER. Not as excited for OAS and SKUA (?!). This entry was posted in Daily Puzzles and tagged Anna Shechtman, Mike Shenk, Patrick Blindauer, Paul Coulter, Samuel A. Donaldson. Bookmark the permalink. 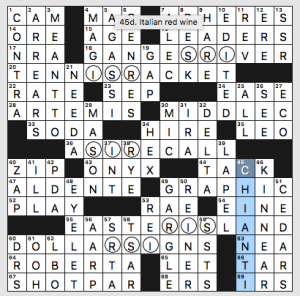 I swear, TNY makes printing its puzzles harder each week. This time, it’s a genuine pdf, although the square numbers in the grid are unhelpful blurs. But now the text is in tiny type and the grid is huge, the combo filling much less than the page. It’s like they keep thinking of ways to make this harder to solve. And I’m a subscriber, since otherwise I couldn’t print this at all. Lots to love in Anna’s puzzle. Personal favorite was 53a clue for LOUISE. “Touch of Evil” is worth it for Marlene alone. I feared 24d would require drudging up a Latin phrase. Thankfully not. The answer came quick enough with a few crossings.